In the fourth quarter of 2018, African American workers had the highest unemployment rate nationally, at 6.5%, followed by Hispanic (4.5%), Asian (3.2%) and white workers (3.1%).1 This report provides a state-by-state breakdown of unemployment rates by race and ethnicity, and racial/ethnic unemployment rate gaps for the fourth quarter of 2018. The highest African American unemployment rate is in the District of Columbia (11.8%), followed by Pennsylvania (8.9%), Illinois (8.8%), Louisiana (8.0%), and Mississippi (7.7%). The highest Hispanic state unemployment rate is in Washington (7.5%), followed by Pennsylvania (7.1%), Arizona (6.3%), Connecticut (5.8%), and Oregon (5.8%). Meanwhile, the highest white state unemployment rate is 4.6%, in West Virginia. The Hispanic unemployment rate is at or below its pre-recession level in 11 states (of the 16 states for which these data are available). There are three states in which the Hispanic unemployment rate is equal to or lower than the white rate (Georgia, 0.8-to-1, Oklahoma, 0.9-to-1 and New Jersey, 1-to-1). The largest gaps between Hispanic and white unemployment rates are in Nebraska (2.4-to-1), Virginia (2.3-to-1), Connecticut and Pennsylvania (2.1-to-1 each). 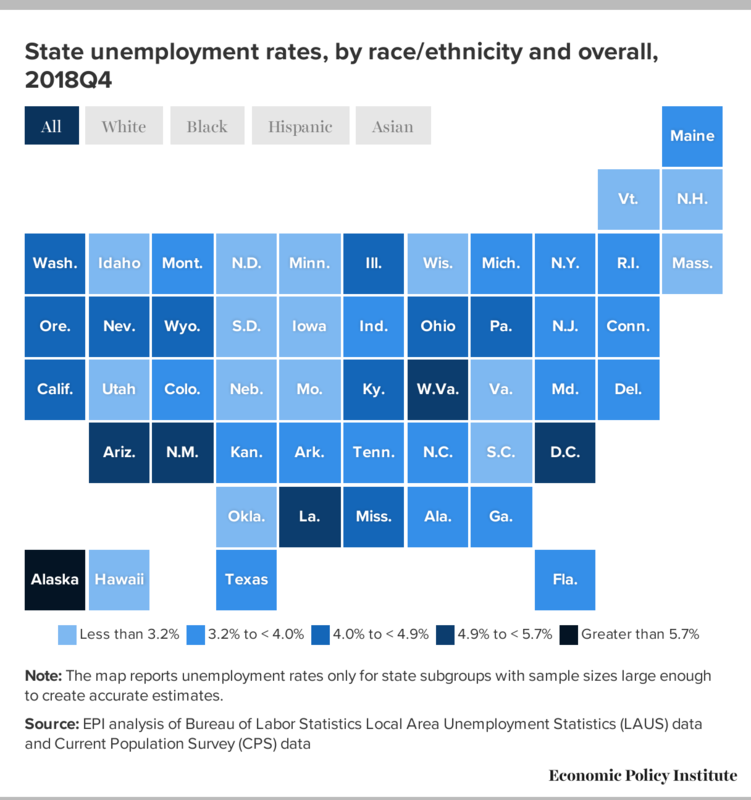 In the fourth quarter of 2018, the white unemployment rate was lowest in South Dakota (1.5%) and highest in West Virginia (4.6%), as shown in the interactive map and underlying data table, which present state unemployment rates by race and ethnicity. African American unemployment rate estimates are available for 22 states and the District of Columbia. Among states, the unemployment rate for African Americans was lowest in Virginia (4.3%) and Florida (5.1%), and highest in Pennsylvania (8.9%); in the District of Columbia, it was 11.8%. The District of Columbia also had the highest black unemployment rate during the previous nine quarters. In the fourth quarter of 2018, of the 22 states with African American unemployment rate estimates, all had black unemployment rates below 10%; in 10 of these states, the rate was at or below the fourth-quarter national average for African Americans (6.5%). Hispanic unemployment rate estimates are available for 23 states and the District of Columbia, and data on the change in Hispanic unemployment rates since the fourth quarter of 2007 are available for 16 states. In the fourth quarter of 2018, among states, the Hispanic unemployment rate was highest in Washington (7.5%), Pennsylvania (7.1%), Arizona (6.3%), Connecticut (5.8%), and Oregon (5.8%). The rate was lowest in Georgia (2.2%) and Oklahoma (2.4%). Asian unemployment rate estimates are available for 11 states, and data on the change in Asian unemployment rates since the fourth quarter of 2007 are available for eight states. The Asian unemployment rate was lowest in New York (1.9%) and highest in Washington (4.8%). The Asian unemployment rate was at or below its pre-recession level in California, Hawaii, Nevada, New York, and Texas. In three states the Asian unemployment rate was above its pre-recession level: New Jersey (2.2 percentage points higher), Washington (1.0 percentage points higher), and Illinois (0.4 percentage points higher). The unemployment rate estimates in this report are based on the Local Area Unemployment Statistics (LAUS) and the Current Population Survey (CPS) from the Bureau of Labor Statistics. The overall state unemployment rate is taken directly from the LAUS. CPS six-month ratios are applied to LAUS data to calculate the rates by race and ethnicity. For each state subgroup, we calculate the unemployment rate using the past six months of CPS data. We then calculate the ratio of this subgroup rate to the state unemployment rate using the same period of CPS data. This gives us an estimate of how the subgroup compares with the state overall. 2. “Labor Force Statistics from the Current Population Survey: Unemployment Rate,” Series Id. LNS14000000 [online data table], U.S. Bureau of Labor Statistics, last accessed April 2019.